FREE 5 YEAR/100K WARRANTY!! SEE MORE PHOTOS OF THIS VETTE AND 125+ OTHERS FOR SALE AT WWW.BUYAVETTE.NET! Code correct Sebring Silver exterior, code correct Black vinyl interior (upgraded to leather seating), Black convertible top. Numbers matching 340hp 327ci engine, 4 speed manual transmission. 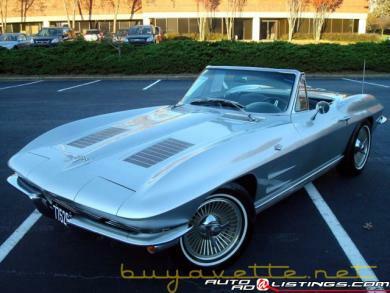 Assembled on December 3, 1962, this gorgeous 1963 Corvette Convertible is in very nice condition, and is very correct as well. Paint on this car is in very good condition, looking to have been done within the last few years, with an excellent shine and few flaws. Convertible top is newer as well, and is in very good to excellent condition with no rips or tears and a clear window. Chrome bumpers look to possibly be original, and are showing some light patina, but no rust, dings, or heavy scratches. Chrome exterior door handles might also be original, but are in very good condition with no apparent pitting or other issues. 3 out of 4 of the taillights are excellent with no cracks, and the weatherstripping appears to be newer as well. A set of older knockoff wheels are on this car, and are in good condition, wearing what look to be nearly new Michelin X Radial whitewall tires with approximately 90% treadlife remaining. The interior of this 1963 Corvette Convertible is in very nice condition as well, with new leather seat covers in excellent condition, and newer correct loop style carpet as well. Door panels and glovebox are in very good condition; console shiftplate looks to be original, and is in overall good used condition. Dash pad is free from cracks, and the steering wheels is in very good condition as well. Gauges appear to be original, with good condition lenses and minor fading on the needles and faces. A Kenwood cassette stereo has been added to this car in the original radio location, as well as a Hurst shifter. The engine compartment of this 1963 Corvette Convertible shows a correct intake, alternator, hoses, hose clamps, and ignition shielding. Engine casting date corresponds to November 27, 1962. Exhaust manifolds may be original, although the casting numbers are illegible. This Corvette features a very nice, solid, rust-free frame. This is a car that is sure to turn heads, and it might as well be you driving it! Call us today! Factory features include 340hp 327ci engine, 4 speed manual transmission, Sebring Silver tintcoat upcharge, AM/FM radio. FREE 5 YEAR/100K ADDITIONAL MILE WARRANTY!! Our Price: $45,900. Financing Available.